A review on the reasons why, and the methodology behind, incident reporting continues. We welcome your thoughts, and reference summaries as well. R Lawton et al. Barriers to incident reporting in a healthcare system. Qual Saf Health Care. 2002;11:15-18. Dr. R Lawton from the School of Psychology at the University of Leeds and colleague looked to better understand “the willingness of healthcare professionals (doctors, nurses, and midwives) to report colleagues to a superior member of staff following an adverse incident or near miss.” They also explored “the difference in reporting of events involving three kinds of behavior defined by (James Reason)–compliance with a protocol, violation of a protocol, an improvisation where no protocol exists.” Lawton theorized that the culture of medicine, along with the increasing fear of litigation, would likely constrain healthcare providers from reporting. Doctors were less likely to report a colleague across the board, even when a colleague deliberately went around protocols. Nurses were the group most likely to report if there was a bad outcome for the patient. Protocol violations were reported most frequently, regardless of outcome. The authors speculate that doctors’ unwillingness to report violations of protocol equal to their nursing or midwife colleagues may be a reflection of the perception that protocols “by many in the medical community (are viewed) as a threat to their professional autonomy”, and that doctors are reluctant to report a colleague as a reflection of “a professional culture in which what may be seen as whistle blowing is taboo.” Either way, the authors conclude that culture change within the NHS may first have to occur in order for incident reporting to deliver its true benefits. SM Evans et al. Attitudes and barriers to incident reporting: a collaborative hospital study. Qual Saf Health Care. 2006; Vol 15:39-43. Incident reporting captures more contextual information about incidents and, when actively promoted within the clinical setting, it can detect more preventable adverse events than medical record review at a fraction of the cost. Near misses are rarely documented in medical records, yet occur more frequently than adverse events and provide valuable lessons in recovery mechanisms without the detrimental consequences of an adverse event. The subjective data provided by incident reporting enable hypothesis building and preventative strategies to be developed and tested. (See article for references). Do you know if your hospital has an incident reporting system? If yes, do you know what form to use to submit a report? If yes, do you know how to access the reporting system? If yes, do you know how to submit a report? How often do you report 11 iatrogenic injuries (listed in Figure 2), and how often should these injuries be reported? Doctors and nurses were equally aware of an incident reporting system at their institutions, but nurses were significantly more likely to have filed a report (89.2% v 64.6% p<0.001). This may have to do with the fact that nurses also knew how to locate, and what to do with, a report to a significantly greater degree. Senior doctors were significantly less likely than their younger colleagues to have submitted a report. Both doctors and nurses completed reports most often for falls and least often for pressure sores. Perceived barriers to reporting for doctors were: 1) Lack of feedback 2) Form took too long to complete and 3) Incident was perceived as too trivial. Barriers for nurses were: 1) Lack of feedback 2) Belief that there was no point in reporting near misses and 3) Forgetting to report when the ward was busy. Of note in this study was that a poor reporting culture had less to do with the cultural environment and more to do with the functionality of the reporting system. Authors did note however, that the “poor reporting practices by doctors…probably reflects the prevailing deeply entrenched belief in medicine that only bad doctors make mistakes.” Authors conclude by highlighting the importance of sharing with staff the changes that are implemented as a result of the incidents reported. RP Mahajan. Critical incident reporting and learning. British Journal of Anaesthesia. 2010; Vol 105 (1):69-75. He states that leadership, larger governing bodies of healthcare and consumers are calling for the information incident reports provide in order to “better understand error and their contributing factors.” Mahajan highlights the World Health Organization (WHO) as having outlined guidelines for implementing effective reporting systems. Additional information on the WHO reporting guidelines can be found here. What Mahajan also includes in his review is the need for a human factors approach to the analysis of medical errors, which considers the human component within the larger context of the health system. Instead of taking the quick and easy summation of an error as “someone’s fault”, a human factors approach takes into consideration all the events leading up to the error through a much larger lens, considering Reason’s “active and latent failures” mentioned earlier. All of this, he says, incorporated into the framework for analyzing critical incidents suggested by Vincent et al Br J Med 1998; (316) which takes into consideration the socio-technical pyramid discussed by Hurst and Ratcliffe and adapted to the clinical setting provides a structured approach for a meaningful root cause analysis of the error. The framework can found in Table 1 of Mahajan’s review. Without meaningful feedback, however, Mahajan and others continue to point out the reports and the analysis are meaningless. As we’ve mentioned, the road to high reliability starts with the formation of a just culture that supports the reporting of unsafe conditions, near misses and adverse events, in order to uncover those conditions within a system that make it prone to harm. It’s a simple statement–one that makes intuitive sense–so why then, has a reporting culture evaded medicine? The following authors weigh in on the how, what and why of incident reporting to show that any related growing pains are well worth the struggle in the best interest of our patients. Lucian Leape MD. Reporting of Adverse Events:Health Policy Report. N Engl J Med. 2002; Vol. 347 (20): 1633-1638. James Reason. Human error: models and management. BMJ. 2000; Vol 320:768-770. Reason’s explanation of a just culture is one in which error reporting is handled in a non-punitive manner, looking to understand active failures and latent conditions within a systems context. However, he recognizes that within the system, each individual remains accountable for their actions. In a high reliability organization, every individual is reminded of the value of incident reporting as the focus is put upon intentionally looking for anything that could result in harm. Charles Vincent. Incident reporting and patient safety. BMJ. 2007; Vol 334:51. …a functioning reporting system should no longer be equated with meaningful patient safety activity. Organisations must move towards active measurement and improvement programmes on a scale commensurate with the human and economic costs of unsafe, poor quality care. The follow up on each report is reinforcement for the next incident to be reported. And it must be meaningful, productive feedback that rewards those who take the time and stick their neck out to share information. As we have touched on previously, high reliability organizations are built upon a foundation with a just culture as the framework. That framework is comprised of a number of components, with incident reporting playing an integral role. Without a thorough understanding of a health system’s strengths and weaknesses achieving high reliability will be challenging, according to the experts. To better understand the areas of potential weakness, every unsafe condition, near miss or harm event needs to be reported and analyzed in order to find the place where, as James Reason advises, the holes in the swiss cheese are soon likely to line up, and cause greater harm. For those unfamiliar with Reason’s work, Bob Wachter MD provides good background information, describing him as the “intellectual father of the patient safety field” in his post, “James Reason and the foundation of patient safety” on KevinMD. Unsafe condition: Any circumstance that increases the probability of a patient safety event; includes a defective or deficient input to (or) environment of a care process that increases the risk of an unsafe act, care process failure or error, or patient safety event. An unsafe condition does not involve an identifiable patient. Near miss: An event that did not reach a patient. For example: discovery of a dispensing error by a nurse as part of the process of administering the medication to a patient (which if not discovered would have become an incident); discovery of a mislabeled specimen in a laboratory (which if not discovered might subsequently have resulted in an incident). Patient harm: Physical or psychological injury (including increased anxiety), inconvenience (such as prolonged treatment), monetary loss, and/or social impact, etc. suffered by a person. Why should we report these incidents? Because every report submitted provides an opportunity to improve upon an aspect of patient care that could potentially cause greater harm in the future. High reliability organizations are mindful and working toward improvement every minute of every day. As such, they look for the opportunities to improve that these reports provide. It is important that everyone in the health system–from environmental services to CEO–understands they can (and should) play a role in improving patient care by submitting an incident report in real-time when they see, or are part of, any of the events mentioned above. Having everyone in the organization with a like mindset, increases the chance a potential harm will be caught before it reaches the patient. And by rewarding and celebrating those who submit reports providing that opportunity to improve a just culture is further solidified. In my last post, I mentioned the intervention we designed at the University of Illinois Medical Center to increase incident reporting by resident anesthesiology physicians. In the two-year retrospective analyses we used as our baseline measure, we found that residents reported 0 adverse events (AE) per quarter. At the end of the intervention period (7 quarters after study completion), we found that number had increased to 30 reports per quarter. Defined AEs, medical error, serious error, minor error and near miss. Discussed ACGME core competencies in relation to reporting of harm events. Discussed and clearly communicated the mechanics of filing a report. Provided 24 hour access to a consult service. Discussed how their report would be followed-up, and consistently adhered to this committment. Provided an educational manual/reference tool. Included regular conferences every 3-4 weeks for: a) Review of educational material; b) An opportunity for discussion around the AEs that were reported in an aggregated, de-identified manner; and c) Process improvements that came from their reports and feedback. Included support of the Department of Safety & Risk Management which provided “near-immediate feedback to residents upon receipt of their reports”. When possible, the residents were included in the root cause analysis of the event, or the quality improvement the team put together to address the near miss or unsafe condition. The increase in resident reporting was very encouraging. But what truly tested our just culture was that the reports in one of the three-month periods shed light upon the fact that more than 50% of procedure related incidents reported that quarter were associated with lack of attending physician supervision. No one knew who the reporting residents were in these cases (except our safety department team) and no one knew who the attending physicians were that the residents felt had not supervised them adequately enough. This was because the data was always shared in an aggregated, de-identified manner. The purpose was to learn and improve, not finger-point or blame. Instead of arguing the data, our department rallied around it, and improved our own system of being there at the times residents reported feeling we had not been. Not only were the residents exposed to the educational messaging of the intervention, but maybe just as important, they also experienced firsthand the just culture that engenders a reporting culture after the study is complete and the researchers are no longer measuring. Without a culture in place to reward, support and model incident reporting that effectively addresses the incidents and devises solutions to problems in real-time, results like those found in this study will not last. It would be interesting to give the survey now, to the same group of residents–some who have moved on to other institutions–and see what their attitudes and beliefs around reporting are today. 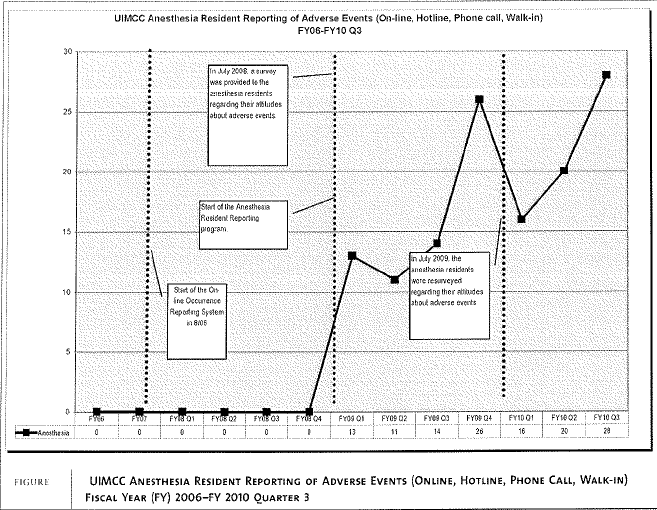 Why Not Put Adverse Events Right In Patient Charts? It is up to us, as role models and educators, to ensure this is the culture that takes hold in medicine moving forward.